Published in the Dover Express, 9 January, 1981. Historically, there is but little to be said of the Dover Castle Estate area of Dover. The name is derived from the Middle Ages, when it was part of the warren attached to Dover Castle; and, being well beyond bowshot of the castle walls, it has been, on some occasions, the camping ground of hostile forces assembled to beleaguer that stronghold. Here, in brave array, were marshalled, for many months, the forces of France when they unsuccessfully besieged the castle in the 13th century; and on this ground appeared the East Kent Royalists, in battle array, when they attempted to wrest the castle from Cromwell’s forces. In later times, this land has been entirely devoted to agriculture and horticulture, and so remained until the second half of the 19th century when the Woods and Forests Department decided to lease it as a building estate. This part of the Dover Crown lands was taken in hand; about the year 1866, by the Dover Land Company, who made a commencement with Albert Road, and roughly formed the lower part of Park Avenue. Nothing further was done until 1881, when Mr William Crundall, by an arrangement with the Woods and Forests Department, and the trustees of the Land Company, took a 99 years ’building lease of the entire estate. The whole of the ground was replanned, giving the roads easier gradients and dividing the land to better advantage. The roads then laid out, are now important public thoroughfares—Park Avenue, a pleasant promenade from Maison Dieu Road up to the principal Park gate; while Salisbury Road and Castle Avenue intersect the estate from north to south. The other existing public thoroughfares, Frith Road and Love Lane, which bounded the north-eastern margin, led to protracted discussion in the town council, extending from 1881 to 1883. Mr Crundall made an offer to give up sufficient land to make Frith Road 40 feet wide, and Love Lane (now Connaught Road), 35 feet; but, at that time, at the bottom of Frith Road, beyond the boundary of the estate, where a former stonemason’s yard stood, there were two cottages, which narrowed the road to 20 feet. It was obviously out of the question to make a 40-foot road with such a narrow entrance. The corporation hesitated to accept the offered land with the obligation to widen the entrance by the purchase of those cottages, but after a year’s delay and further discussion, it was eventually settled that the offered land for widening should be accepted, that the corporation should acquire the cottages at the bottom of Frith Road, that the widening of Love Lane from the bottom up to the first Park gate should be done by Mr Crundall, and that beyond that point the lane should be widened by the corporation. The upper part of Love Lane, opposite the Waterworks, was widened by the unemployed, during the winter of 1884-5, when the gradient was greatly improved by being lowered in some parts as much as four feet. The widening above the Dover Castle Estate was made on the Park side, the land for that purpose being given up by the Crown. Two cottages opposite the Waterworks were removed from the Park banks, and paid for out of the Waterworks loan, as it was considered that their removal was insurance of the purity of the water supply. Park Avenue, which was the first part built upon, is the main artery of the estate, passing diagonally from the junction of Godwyne Road and Maison Dieu Road up to the lodge entrance of Connaught Park. When laid out, it was planted with trees, which grew into a fine avenue. Building on this avenue commenced in 1885 and, when the first edition of this book was written, in 1906, much of the western side was still undeveloped. The lower side was soon completed but it was not until 1926 that another house was built on the upper part. On the west side of the road was a large tennis ground to which the- Dover Tennis Club moved in 1893 when the old tennis courts at the rear of Park Street disappeared in the construction of electricity generating works. Later the courts were used by the Garrison but eventually the freehold was acquired by Kent Education Committee in connection with the development of the county school, which is now the Girls’ Grammar School, in Frith Road. Salisbury Road, named after the Marquis of Salisbury, who was for some time Lord Warden of the Cinque Ports, is also a fine avenue, planted with trees. As built, the road consisted of 60 houses, without counting two that abut on Park Avenue, and they were sub-divided into various “Gardens“ but subsequently the properties were numbered in the usual manner. At the southern end was Ennismore Gardens, consisting of six houses. The other six terraces are on the north-west of Park Avenue, one, comprised of ten houses in Queen Anne style, built of red brick, was called De Vere Gardens, named after De Vere, Earl of Oxford, who anciently owned the Manor; and further, in the same direction, was Randolph Gardens, in five terraces, the gardens in front giving extra space between the houses. These gardens were named after Lord Randolph Churchill. At 1 Salisbury Road, once known as 35 Randolph Gardens, the first edition of this book was written by the late John Bavington-Jones. Castle Avenue runs parallel with Salisbury Road, nearer the park, on a higher level. It was planted with trees, making a well developed avenue, between thirty and forty houses being built there, those on the northern side arranged in terraces, and on the southern side detached. The views of the western hills which properties in this road command are some of the finest in Dover. At the comer of Castle Avenue and Park Avenue St Ursula’s Roman Catholic School was established. Frith Road, for the widening of which a considerable amount of land was given, did not add greatly to the rent roll of the estate, for some years the houses on the south side, known as Connaught Park Gardens numbered but twelve, arranged in six pairs, and, although another four were added in 1904 it was not until 1914 that a big empty space at the comer of Frith Road and Castle Avenue was built on, the Kent Education Committee erecting a new county school building there. 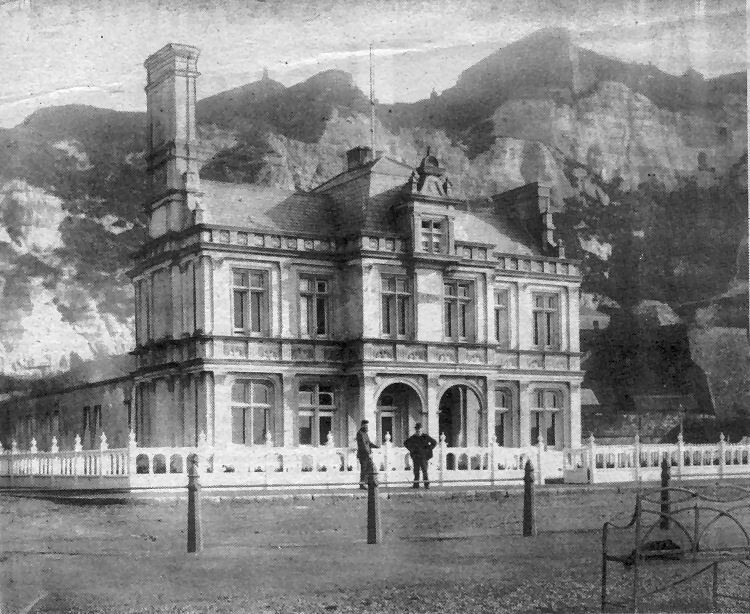 Many generations of Dover schoolchildren learned to swim in these old Sea Baths built on Marine Parade, below the Mote Bulwark on the cliff face below Dover Castle. The swimming baths were built in 1878 and this photograph is believed to have been taken shortly after building work had been completed. The roadway in front appeared to be in a very rough state compared with the promenade suggesting roadworks of some kind. Owned by Dover Corporation the baths consisted of two large swimming pools, one for men and one for women, mixed bathing being taboo until comparatively recent times. The baths were wrecked by shelling during the second world war and, being considered beyond repair, were demolished and Dover had to wait over 30 years before indoor swimming facilities were again provided by the corporation, at the Dover Sports Complex in Woolcomber Street.